Since 2008, Show Expert Systems has registered nearly 2.5 million attendees, moved over 125 million cases, and generated more than $3.1 billion in customer revenue. Show Expert helps us to deliver results-oriented events that make us a more valuable partner for our customers and vendors. We love the software and the people behind it. — Ladwina Isaac, PMP White Rose, Inc. Capture vendor, item, and attendee information online. Check-in attendees, transact orders and leads, and generate more new case sales. Modify show day orders and get performance reports to measure your success. Online registration reduces lines on-site and makes attendees happy. Pre-registered customers receive a name badge, purchasing credentials, and a buying plan before the event. On-site, they get a quick scan of their badge and head straight for the show floor. Sales reps can pre-book historical purchases online. These pre-orders can be booked automatically when an attendee arrives at the event. This gives customers more time to focus on new products on the show floor. Distributors and vendors establish item-level rebates online. Online negotiations eliminate the typical faxing and emailing of spreadsheets. The process is Sarbanes-compliant and paper-free. Registration is attendees' first impression of your event, and we help you to put your best foot forward. Our system is simple for registration operators, and quickly generates badges, reports, and buying credentials for customers. Seminar registration is also available. 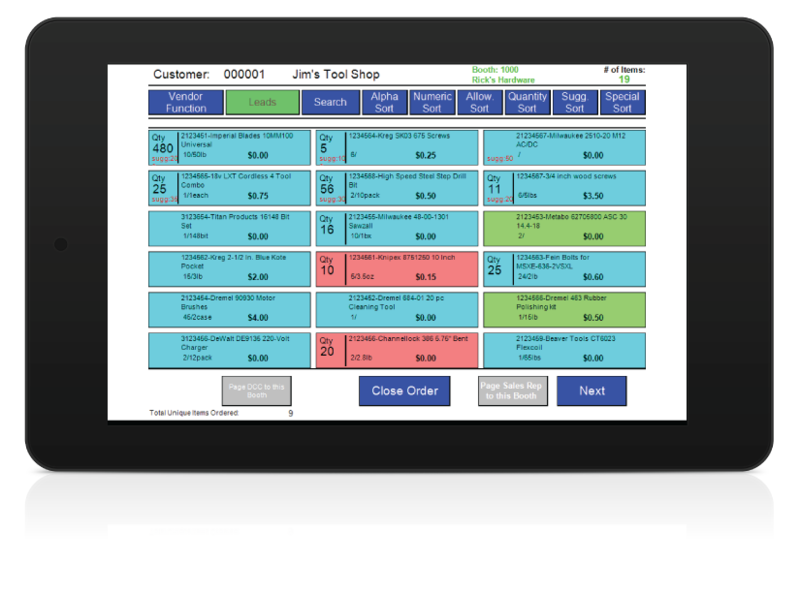 Orders and leads are captured on iPads, tablets, or POS devices. Our software is easy to use for exhibitors, customers, and sales reps. The average time to place an order is just under a minute. For customers not ready to make a purchase, leads can be captured at the vendor or item-level. Customers can even choose the type of follow-up they'd like to receive post-event. Sales reps can assign new or significant items to each of their accounts pre-event. On-site, targeted items are highlighted on the ordering device so that vendors know where to focus their efforts. Customers get a targeted items report at registration to guide their course on the show floor. Vendors/brokers or sales management can negotiate additional rebates on any item in a booth. Negotiated deals add real power to tip a customer’s business on a targeted or significant item. Sales reps and show management verify and modify show orders online. Accurate order fulfillment reduces returned goods prevents unplanned costs. The morning after the event, we deliver data files with all orders and rebates. We have all of your reporting staples, including executive summaries, attendance reports, and order analysis by sales territory. Need something special? We provide custom reports, too.